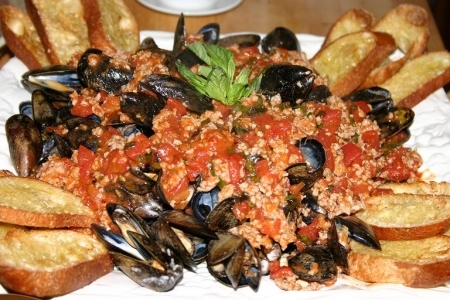 This is a hearty take on a traditional mussel dish by adding Italian sausagel. The croistini is a must to scoop up all of the sauce and sausage! Pasta won’t have the same flare as the croistini, because of the garlic that is on the croistini. Mussels are to be eaten immediately, because they do not have the same pizzazz cold. Mussels do not make great leftovers, so invite a group and have mussel mania! A meal for 4 adults, or an appetizer for a party of 8. See Chatty Advice below before purchasing and preparing mussels. To make marinara, heat olive oil in a large deep skillet over medium high heat. Add sausage and cook until browned. While cooking sausage, try to break big pieces into small pieces to make sure everything cooks consistently and that when combined with marinara, there are no large pieces. Once sausage is thoroughly cooked, add crushed tomatoes, white wine, basil, garlic and butter. Let simmer for 20 minutes. To cook mussels, heat white wine in a large pot over high heat. Add mussels and cover. Cook until mussels open up, about 5 minutes. Drain mussels and discard any that did not open. Pour mussels into a large serving platter. Then pour sausage marinara over the top of the mussels. Serve with the toasted bread and get ready for a feast! Try Le Volte Red Wine of Toscana Super Tuscan (Italy), Podere del Guiggiolo Corte alla Flora (Italy), Masi® Campofiorin® Rosso Del Veronese (Italy) or Farnese Sangiovese (Italy). Mussels must be kept alive until they are cooked. So do not suffocate them in a plastic bag or drown them by soaking them in water. As soon as coming home from the grocery store, empty the bag of mussels into your sink. Thoroughly but quickly rinse all of the mussels. Place into a strainer filled with ice, place the mussels on top of the ice and place the strainer in a large deep container that the ice can melt into. Do not cover. Refrigerate until ready to cook them. When rinsing the mussels, any with cracked shells should be discarded. If you find any that will not close when handled or given a light tap, discard them as well, because they are dead. They will open to breath but once touched, tapped or are moved around they should close. If in doubt smell them. They will probably have a bad odor if they are dead. When mussels are cooked they should open. If some mussels did not open after cooking them, discard them. However, if half did not open they may not have been cooked long enough. Some mussels will only partially open, if in doubt, discard them.